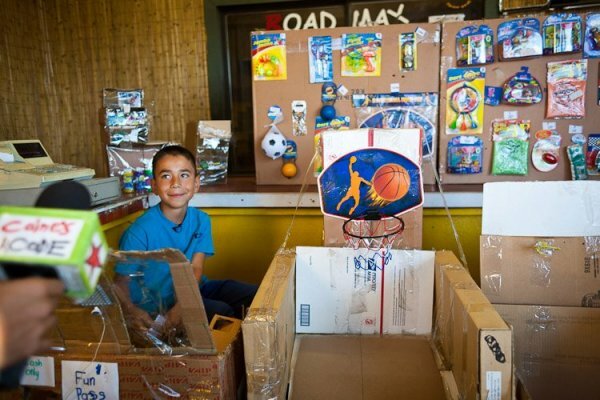 Caine Monroy is a nine-year-old boy who spent his summer building an arcade in his Dad's used auto parts store. The meticulous attention to detail, the elaborate nature of the system, the complexities of the games, all of it is nothing short of amazing. Keen to monetize his business, Caine placed two price brackets on the use of his arcade. Visitors can play the likes of basketball, football, and a claw machine four times for $1; but chances are most of you will go for the 500 turn "Fun Pass" for just a dollar more. He's even thought so far as the prevention of Fun Pass piracy, writing a numerical code on the back of every pass. This corresponds to the square root of the number, confirmed by a calculator Caine has attached to every game. With all the hard work and dedication he put into building Caine's Arcade, selling the idea to passers by and creating evermore foolproof arcade games, only one visitor had a turn. Nirvan Mullick bought a Fun Pass, and immediately became enticed by the homemade nature and mechanical genius of it all, as Caine would crouch down behind each machine and feed winning game tickets through a slot to Nirvan. One twist though: Mullick is a filmmaker, and he has turned Caine's Arcade into a viral and social phenomenon, along with paid for a college education for the young boy entirely through donations. He began shooting his short documentary, while also organising a flash mob of visitors via Facebook and Reddit. On October 2nd, Caine got the huge crowd of customers that he had always dreamed of hosting. Take a look at the short documentary below, which has captured the hearts and minds of millions of viewers across the globe. So far so that the target $100,000 college fund that Mullick set up via paypal is extremely close to being met in such a short period of time ($95,000 at the time of writing). In a time when you hear many people claim that the arcade industry is dead/dying, this reminds you just what life, energy and excitement the sector still has within it. It also reminds us of our childhoods full of imagination and creative thinking, which understandably was nowhere near the calibre of this young fellow. Here's to a brilliant future for Caine, as he grows up to become one of the great minds of the next generation in the mechanical world.